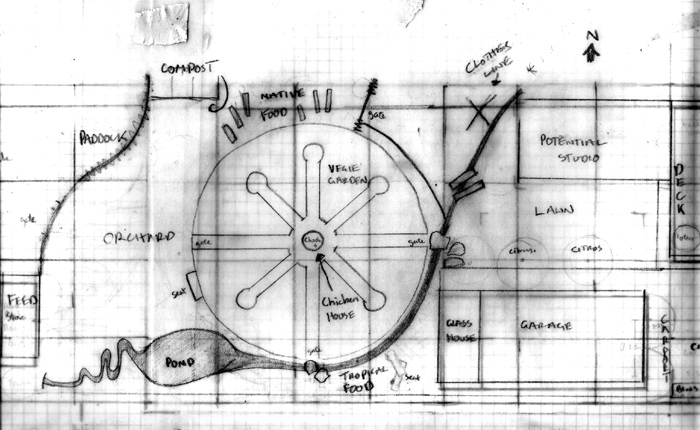 Drawing plans for a garden can be a surprisingly abstract experience. John Brookes, is I surmise to be a well regarded garden designer, as I discover his garden in my Phaidon book of famous gardens. 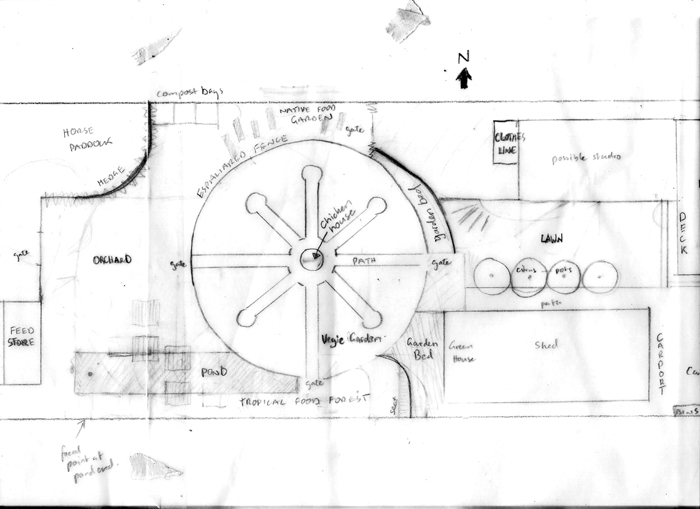 His approach to garden layout is to play with abstract shapes on an overlay of a site map, as detailed in ‘Your Garden Design Book'. This process is fun. I found myself playing with random shapes, not thinking too much of the finer details. Circles, I love circles. I discover the effectiveness of this approach to creating a basic structure to the garden. It all seems to come together quite easily. 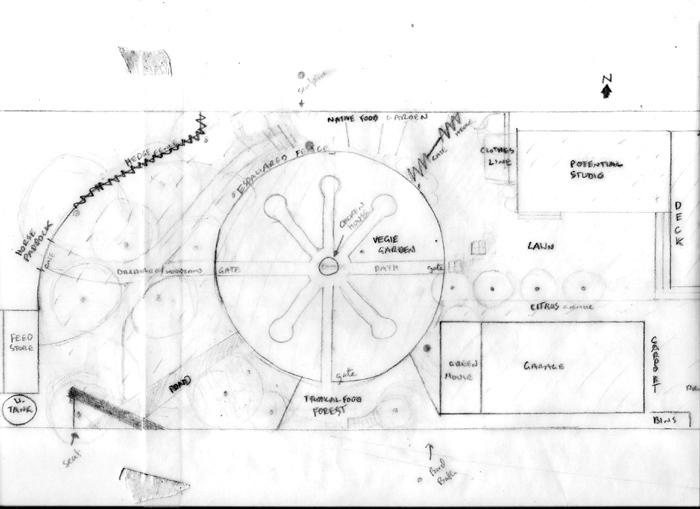 In the final plan the shapes might be delineated by a fence, the edge of a path or a garden bed. There is a useful key to this design process for getting the proportions right. Brookes lays a grid over the site plan. The size of the grid and whether it sits on a horizontal or diagonal plane is determined by the size of the site and existing main structures, such as a house. The grid allows the garden to relate proportionally to the key features of the site. I chose to make my grid approximately 3.25m for the side of each square. This is half the width of a proposed deck a the rear of the house and appropriate to the site which is 13.5m wide, thereby fitting just over 4 squares across the width of the site. Note that my grid does not fit snugly to the site boundaries, I want to draw attention away from the boundaries, therefore making it of less importance to line design elements up with them. When playing with the shapes of the garden layout I use the grid as a general guide. Not everything need line up precisely with it. 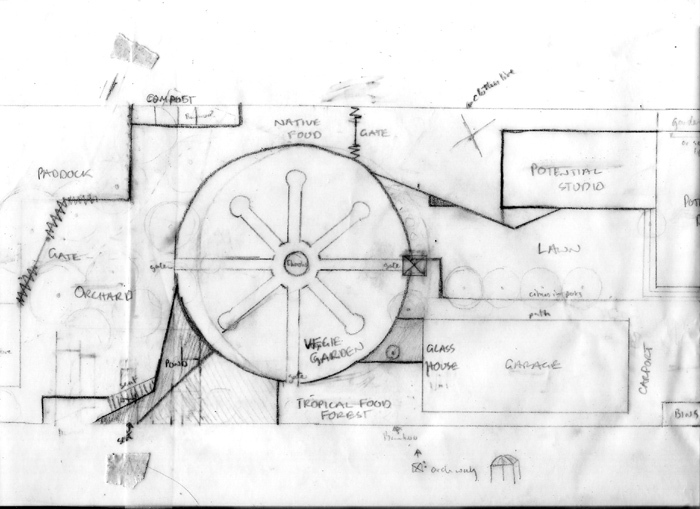 The circular vegie garden for example is approximately 3 squares wide, but sits a little off the lines of the squares to allow some space between it and the glass house. 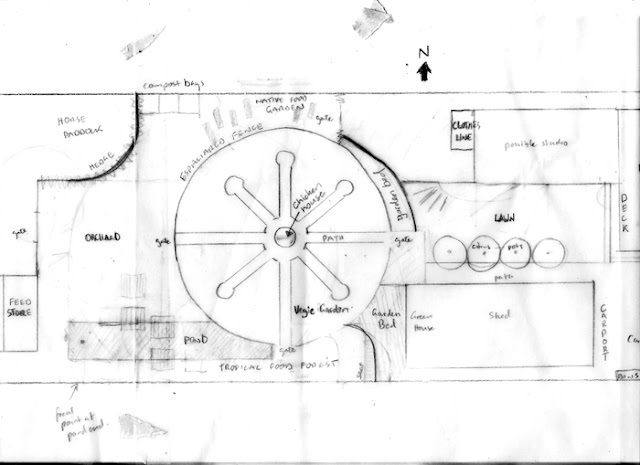 Each of the zones are placed in the same location on each of the four possible garden layouts. These positions were chosen based on a study of the sun and shade patterns of the site, drainage, slope, and the siting of high visitation areas closer to the house. The differences between each layout are the shapes and lines of the fences, pond and garden beds. These lines will form the foundation and style of the garden. We are still not sure which one we like best. We would love to hear your thoughts and ideas on our plans. Which would you choose: Plan 1, 2, 3 or 4?